Favado App | A Savings WOW! 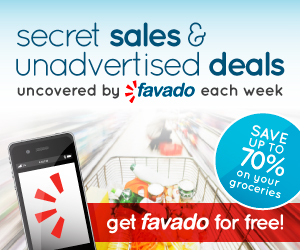 Download the FREE Favado App – Save Time and Money on Grocery Shopping! Sign up today for the Favado app and have your favorite stores’ sales and matching coupons available at your fingertips. It also helps you find unadvertised deals to save you even more money. – First, sign up for Favado here. – Then, download the app for free on either on iTunes (iPhone) or Google Play (Android). – Sign into your Favado account when you open up the app. – You can select up to 10 of your favorite stores to add to your app. – You’ll see all of the items on sale at each store and be able to see the available coupons for each item. You’re also able to add them to your shopping list.